Tai Lei Loi Kei is the incredibly famous 50 year-old pork chop bun store from Macau. They are well known for their succulent, tender and delicious pork chop buns. In addition to their four outlets in Macau, they opened their very first international franchise at NEX Shopping Mall in Singapore on 20 December 2014. This is a review of the original flagship store at Taipa Village, Macau. If you’re looking for our review of their Singapore branch at NEX, click here. Ms Kwok Loi-Ho established Tai Lei Loi Kei back in 1968 at Taipa, Macau. Her secret was the homemade marinated sauce that was handed down for two generations. They also use only top quality pork from Brazil. This means that you get super lean top quality Brazilian pork chop with little fat. We made the pilgrimage to Taipa Village in Macau after taking the 8am ferry from Hong Kong. It is not very easy to get to Taipa Village as there are no direct shuttle buses from the hotels and casinos. You have to take a free shuttle bus to Galaxy Macau and take a short walk from there. Macau is no Hong Kong in terms of service. However it is not New York either. That said we encountered nothing but pleasant service during our day in Macau, and you could tell that the service staff were used to dealing with tourists from all over the world. With a resident population of around 650,000 in 2015, Macau saw a total of 28 million visitors from January to November 2015, making an average of 2.5 million tourists a month. In comparison, Singapore only received 1.2 million tourists per month in 2015 despite having a resident population of 5.5 million. With the typical tourist demographic, food establishments in Macau are generally better equipped to deal with the English speaking crowd, and the menu came with nice English subtitles on most of the items. On our trip to Hong Kong and Macau, we were pleasantly surprised by the number of famous pork chop places. I love pork chop and unfortunately we don’t have too many famous pork chop eateries in Singapore. However, our trip to Hong Kong’s For Kee for their pork chop rice proved a slight let down after all the hype and reviews. That said, Tai Lei Loi Kei certainly did not disappoint. For those that want to try their famous classic pork chop bun – for clarity I shall refer to it as the toasted pork chop bun – they will only have it for sale after 2pm. So plan your itinerary accordingly. How was it? It was great! The pork chop was tender, succulent and juicy. It had a fantastic aroma that could only come from Ms Kwok’s secret marinate sauce. We loved it! However the toasted bun in this instance felt a bit tough in comparison to the soft and tender pork chop, as such we were not impressed with the bun and pork chop combination here. We rate their classic toasted pork chop bun 4/5. It will set you back MOP$33. The champion today was Tai Lei Loi Kei’s polo pork chop bun. The polo bun is also known as a pineapple bun and unfortunately this particular item is not properly subtitled in English on the menu. It is the 猪扒菠萝包 (zhū bā bō luó bāo) on the right-most column of the menu. For more information about what a polo bun do have a look at our write up on Kam Fung in Hong Kong, where we talk about the polo or pineapple bun. When we arrived at Tai Lei Loi Kei in the morning, their toasted bun was not available at the time so we had to settle for their recommended polo pork chop bun. It was a great choice! Unlike the toasted pork chop bun, the softer sweet polo bun perfectly complemented the savoury pork chop. Take a bite and the explosion of flavours from the pork chop coupled with the sweet and soft polo bun really brought the taste very close to perfection. If we could time travel we would have ordered two polo pork chop buns instead of the toasted pork chop bun. We rate this super delicious item 4.4/5. This item costs MOP$33 as well, priced identical to their toasted pork chop bun. This was one of the best food items that we had the privilege to eat during our trip to Hong Kong and Macau, and if we were to come back here we would definitely drop by Tai Lei Loi Kei again even if we only had one day in Macau. Here’s another gratuitous look at the polo pork chop bun. Coming to Macau for a day trip is tough. You can probably only spend one meal at Taipa Village yet there are just so many things to eat here. If you are a pork chop fan you can split your meal between Tai Lei Loi Kei and the crispy pork chop noodles at Pui Kei Cafe. There is also O Santos Portuguese Restaurant and Seng Cheong Restaurant. For snacks there is also San Hou Lei for their unique egg tarts, Koi Kei Bakery and Gelatina Mok Yi Kei for their pastries. After all that, if we had to choose one item in Taipa Village we would go for Tai Lei Loi Kei’s polo pork chop bun. Oh how we miss you so. 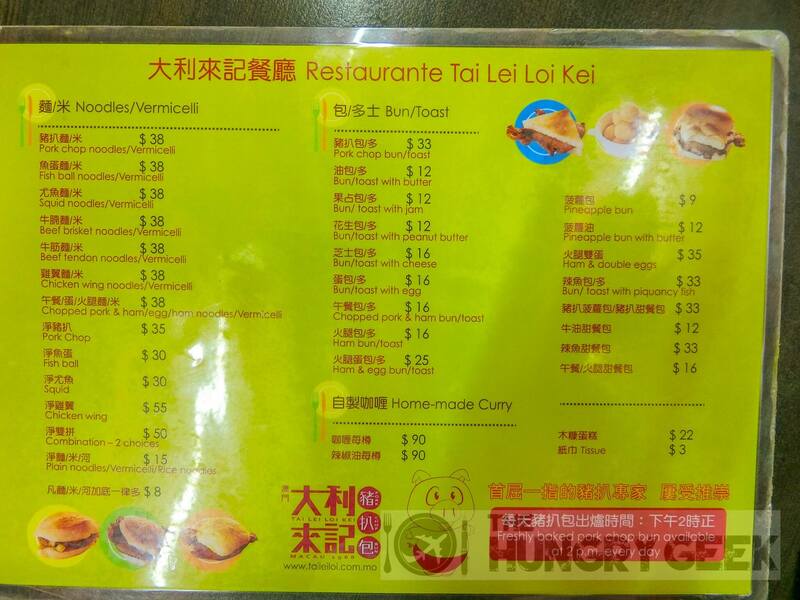 Tai Lei Loi Kei Singapore – Pork Chop from Macau! In "Singapore Cafes"
For Kee 科記咖啡餐室 – Pork Chop In "Hong Kong Cha Chaan Teng"